Reagent exhibits at least 90% transfection efficiency of siRNA delivery. Transfection efficiency was determined by qRT-PCR. Mixed connective tissue disease is a rare autoimmune condition when the immune system mistakenly attacks the body, with different kinds of connective tissues possibly being affected and an exact unknown cause. Extensive preclinical studies are required to overcome any potential limitations and find new treatment approaches for mixed connective tissue disease. Fibroblasts are transformative cells that act as precursors to different types of connective tissue cells. Fibroblasts are not dependent on additional growth factors and/or hormones, therefore it is relatively easy to grow fibroblast cultures that can readily interconvert to various cells that compose the connective tissue. The D-451 fibroblast cell line was derived using mouse (Mus musculus) fibroblast cells. This murine cell line exhibits high cellular variability, making it uniquely useful for studying of mammalian tissue. D-451 has been widely used to study connective tissue and cells in mice, rats, and other rodents. Altogen Biosystems offers two-component high-efficiency lipid-based transfection reagent kits for the D-451 fibroblast cell line. Figure 1. GAPD mRNA levels were quantified using real-time RT-PCR in the D-451 cells transfected with siRNAs targeting GAPD or non-silencing siRNA. Forty-eight hours post-transfection, the cells were harvested and analyzed by real-time RT-PCR for GAPD mRNA expression levels. Data were normalized against the 18S rRNA signal. Control samples were either mock-transfected or untreated. Values are normalized to untreated sample. Data are means ± SD (n=5). Figure 2. Protein expression of GAPDH in D-451 cells. DNA plasmid expressing GAPDH or siRNA targeting GAPDH were transfected into D-451 cells following Altogen Biosystems transfection protocol. 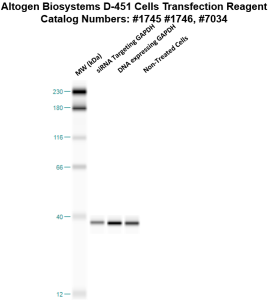 At 72 hours post-transfection the cells were analyzed by Western Blot for protein expression levels (normalized by total protein, 10 µg of total protein loaded per each well). Untreated cells used as a negative control. Altogen Biosystems is a life sciences company that offers cell type-specific and pre-optimized transfection products, electroporation kits, and in vivo delivery reagents. Advanced formulation of reagents and optimized transfection protocols provide efficient intracellular delivery of protein, DNA, mRNA, shRNA and siRNA molecules. Read more about transfection technology at Altogen’s Transfection Resource.